Many of you may know, that as a part of the family’s succession planning [that’s quaint speak for me stepping aside] we collectively agreed that I would have access to a couple of tonnes of pinot noir each vintage with the unchallenged ability to “do it my way”. The first such wine was my 2016 BIG CHAIR. I am about to release my second wine, the 2017 Pinot Noir under the label of FRIENDS. This has been vintaged in a very similar manner to the 2016 and is in my view a worthy follow up. It will, I feel confident, be enjoyed by the impatient now and reward those of you who can resist pulling the cork. There are only 500 bottles available so be quick to secure your allocation of 6 bottles max or fewer.. The Melbourne Food and Wine Festival [MFWF] has just concluded a long week of events for its twenty fifth year and what a week it was, coinciding as it did with the announcement of the Top 50 Restaurants of the World in Melbourne. It was generally agreed this year was the best yet and set a new benchmark for food and wine in this state. On the Festival’s final night 140 guests were treated to a special dinner in the MFWF Wine and Food room in Little Lonsdale Street with Scott Pickett from Estelle Restaurant preparing an amazing line up of five courses. This feature event was an opportunity for 12 MFWF “Wine Legends” to each host a table of 10 guests and match a range of their own and related wines to Scott’s menu. Same food but different wine for each table. As a Legend I was invited to participate and searched my cellar from top to bottom for an appropriate pairing for each course. If you click HERE you can see the menu and the wines I matched to each dish. And to add to the fun I had the good fortune to have the redoubtable Adam Cash, late of Union Dining in Richmond and now at MAHA in the CBD acting as my sommelier for the night. For reasons I’m not clear about, so popular was my table that I finished up hosting a group of 23 guests rather than the expected 10 and this required moving to a Private Dining Room. Here are two photos attached, one of me speaking to my guests and another of the 12 “Legends” who presented on the night. They and their wineries are named in the caption. Bring on the 2018 Festival I say. A number of years ago, while travelling through Spain, I discovered Marcona almonds; a rather different and dare I say superior nut to the common or garden variety almond widely known in Australia. On my return I thought I might plant a few trees at the vineyard and made the rounds of local wholesale fruit tree nurseries in search of some. Unfortunately I was met with a blank stare, no one in Australia was familiar with the Marcona variety. Undaunted I began to phone around fruit tree grower associations and, lo and behold, eventually found a girl in the bud wood import section of the Department of Primary Industry in Adelaide who proudly announced they were about to release the first ever stocks of Marcona buds in Australia. “Great” I said, “I’ll take 50 buds please, for grafting myself”. I was promptly told, however, that I wasn’t eligible as I wasn’t a registered fruit tree grower. Problem solved; I simply rang a colleague who was registered and asked him to graft the trees for me. I had 50 trees delivered in 15 cm pots a year later. I planted a dozen out on the property and sold or gave the rest to anyone who was interested. And in so doing I became the FIRST person ever to have this variety in Australia. As the years have passed I’ve been increasingly frustrated at my inability to protect the small crops from the marauding cockatoos who absolutely obliterate the embryonic nuts long before they are anywhere ready for harvest. So as it turns out I’m most likely NOT the first person to harvest Marcona here, others who planted later may well have been more successful. This year was different though, nothing was going to stop me and I spent a small fortune in protective measures. So here, finally, are my first crop of Marcona almonds. On the right (pictured below) we have the just harvested husks and on the left the shelled kernels. I only wish I had enough to share with visitors to the Wine Centre….but maybe next year! As a boy growing up in Brisbane I didn’t know any family named Crittenden other than the one I belonged to, and it was made up entirely of my mother and father brother and sister. To this day I am unaware of any connected relations bearing my family name. In the early 1960’s I moved to Melbourne (alone) and by the mid 60’s in my early 20’s had developed a modest interest in wine. One day I attended a wine tasting [yes, they had them back then] at, of all places, Burney Horticultural College. Imagine my surprise when another of the attendees on introducing himself to ask a question said “I’m Doug Crittenden, wine-merchant”. To say I was gobsmacked would be an understatement. It was the first time I had encountered anyone claiming to share my name. Needless to say I soon introduced myself and so began my lifelong friendship with an icon of the retail wine business in Melbourne and for that matter the whole of Australia. It’s a matter of record now that roughly 20 years after that chance encounter I planted five acres of grapes on the Mornington Peninsula and in so doing doubled the then total plantings; today there are in excess of 2500 acres under grape vines here. Needless to say I was then and still am constantly asked whether Doug was my father?, uncle?, cousin?, you name it. People react with surprise when I say I’m no relation. And I’ll warrant that many of you reading this would have been familiar with and shopped at Doug’s store and most likely known the gregarious man himself. Doug died in late 2014 aged 91 and its estimated that upwards of 300 people attended his memorial service at St Johns in Toorak. Over the years Doug, at his various shops but particularly at his Hawksburn store, became a firm supporter of our family wines. In 1999 he and his wife Judy faxed me a lovely letter congratulating me on the sale of our families one millionth bottle of wine. As a matter of interest I reproduce it here. Of course, I was a regular visitor to the Hawksburn store and soon became familiar with the adjoining, and equally as famous, Peter Bouchier’s butcher shop. 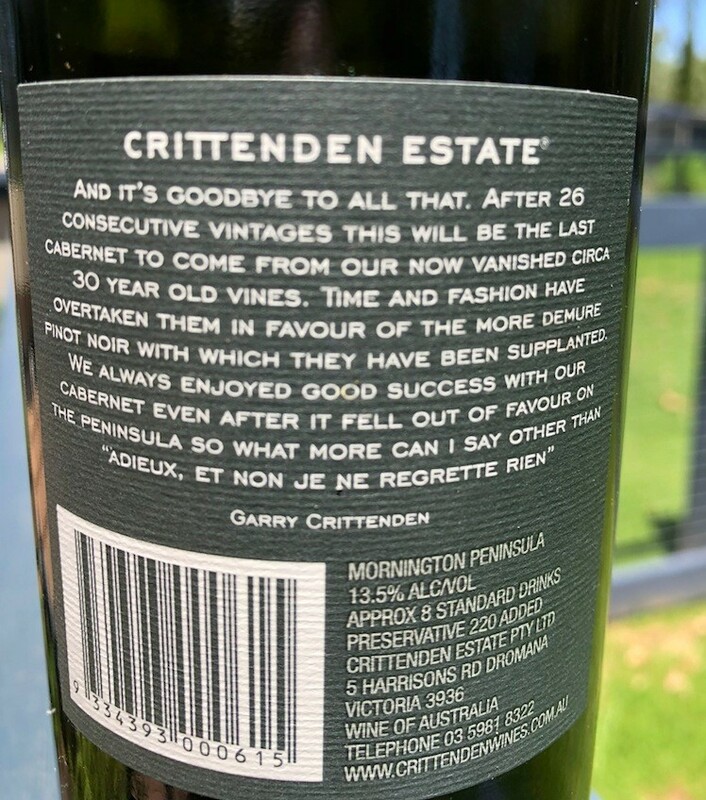 BACK TO THE FUTURE and the Crittenden name returns to Hawksburn Village, Peter Bouchier has just become a stockist of a range of our wines, AND what’s more, the original letter from Doug and Judy sits framed there and proudly on display in memory of times past. Go in and take a look! GARRY CRITTENDEN, DROMANA, APRIL 2017.